WASHINGTON — Two major contracts announced Friday, including a long-awaited F-15 sale to Qatar and the first-ever international KC-46A tanker sale, will give Boeing a reason to celebrate this holiday season. The first contract, worth up to $6.1 billion, includes 36 new F-15 fighter jets for Qatar. The Air Force also awarded a separate deal to Boeing for one KC-46 for Japan with a price tag of about $289 million. The F-15QA order is critical for Boeing, as it will extend the F-15 production line into the next decade. However, it appears to be smaller than initially predicted. The U.S. government and Qatar finalized the F-15QA deal in June, then estimating a total value of $12 billion for 36 jets. When the deal was approved by the State Department in November 2016, the Defense Security Cooperation Agency estimated a total value of $21.1 billion for 72 jets — not an unusual circumstance, as the final agreed-upon contract award often is lower than DSCA’s initial estimates. The U.S. and Qatar today signed finalized the sale of F-15QA fighter aircraft, worth $12 billion. 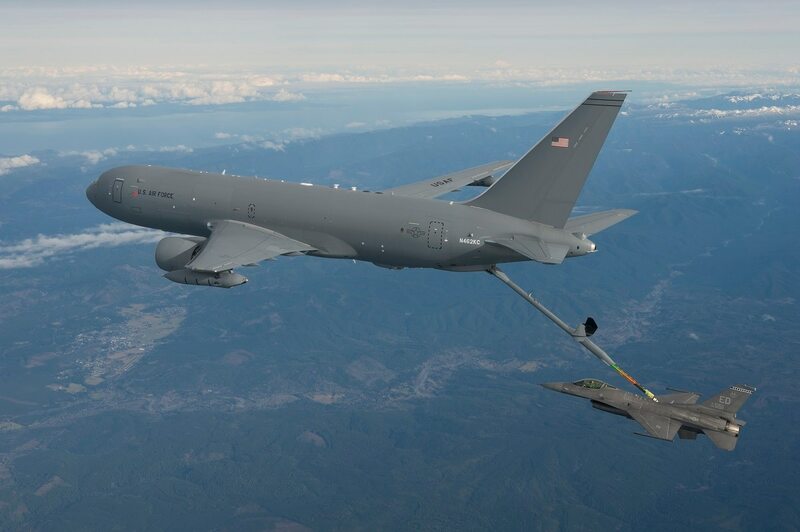 Boeing’s first sale of the KC-46 marked an important symbolic victory for the beleaguered tanker program, which has lagged in development and international sales compared to its closest competitor, the Airbus A330. Friday’s deal could signify the start of greater international buy-in to the program, something that Boeing officials see as critical for making the program profitable and the U.S. Air Force sees as important for enhancing interoperability with partner nations. Despite stiff competition from Airbus, Boeing is confident its KC-46 will ultimately gain a foothold in the Middle East. Boeing’s agreement with Japan includes one KC-46, the non-recurring engineering work necessary to build it to Japanese requirements and logistics support, according to the contract announcement. Work is expected to be complete in 2021. Importantly, the parties entered into a firm, fixed-price agreement for the KC-46, similar to Boeing’s current contract with the U.S. Air Force. That means that if Boeing is responsible for cost overruns, the company will have to pay for them. Boeing is one step closer to clinching its first foreign customer for the KC-46A. The U.S. Air Force plans on buying 179 KC-46s. Boeing is contractually obligated to deliver the first 17 certified tankers to the service next October. Over the past several months, the tanker has run into technical issues — including a still unsolved problem with the tanker’s boom, which sometimes scratches the surface of the receiving aircraft. However, the program is making progress in other areas. The Federal Aviation Administration has certified the 767-2C, the modified 767 commercial plane that forms that basis of the KC-46, Boeing announced Thursday. The program still has to attain one final certificate for the aircraft’s military-specific equipment from the FAA. The State Department approved the KC-46 sale to Japan in September 2016, then estimated to have a value of $1.9 billion. Correction: The original version of this story misstated the number of jets agreed upon in the June 2017 deal between Qatar and the United States.